Are you comparing the Canon 70-200 f2.8 with other lenses? There are some great alternatives. It is a tough choice. It is a pricey lens, but its performance is remarkable. This post will help you decide if it's the right lens for you. The maximum aperture of f/2.8 gives you great shallow depth of field opportunities for photographing your favorite friends as you can see in the photo below. My Canon EF 70-200 f2.8 IS Lens has been my favorite portrait lens for many years. At 70mm, you can still photograph small families or take full-length, individual poses at a comfortable distance. At 200mm it's great for head shots and more distant perspectives for small family groupings. It's okay for moderate wildlife photography such as at a zoo or a nature park. It has also been a decent sports photography lens for me to use with high school and youth sports. 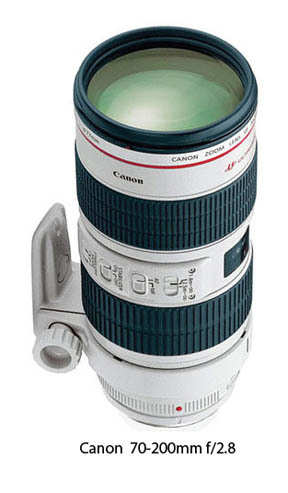 I have used this Canon camera lens at the US Tennis Open as well as at bike races, soccer matches and basketball games. 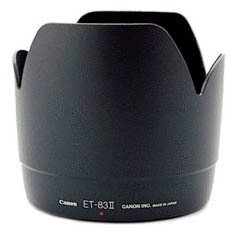 It's a very fast lens, easy to handle, versatile and powerful enough to do a good job in many photography situations. 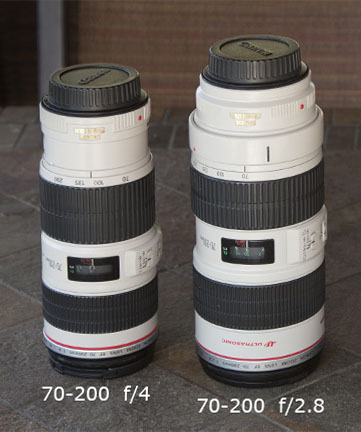 The ongoing Canon 70-200 f2.8 lens vs Canon 70-200 f4 lens debate has always fascinated me. There are times when the maximum f-stop really makes a difference and there are times when it really doesn't matter. 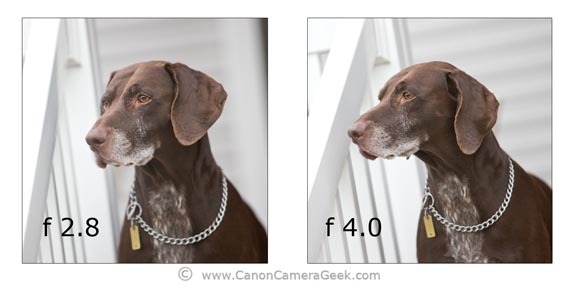 Look at the photo comparison below of using a lens setting of f 2.8 vs. f 4.0 while using the Canon 70-200mm lens. The lens was fully zoomed to a focal length of 200mm which gave me a small depth of field. You can barely see that the siding behind Mocha, the German short-haired pointer, is ever so slightly sharper at f 4. There is a nice separation from the background for two reasons: (1) the contrast in color between her fur and the siding and (2) the shallow depth of field at both settings of f 2.8 and 4.0. Here the Canon 70-200 - f2.8 vs. f/4.0 comparison is basically irrelevant. The Canon 70-200 f 4 is lighter and more affordable than the f2.8 and substantially outsells the Canon f 2.8. I bought the Canon 2.8 because I like having that extra low-light-situation available if I need it. One of the challenges that you may come across when shooting at such a wide open aperture is sharpness. 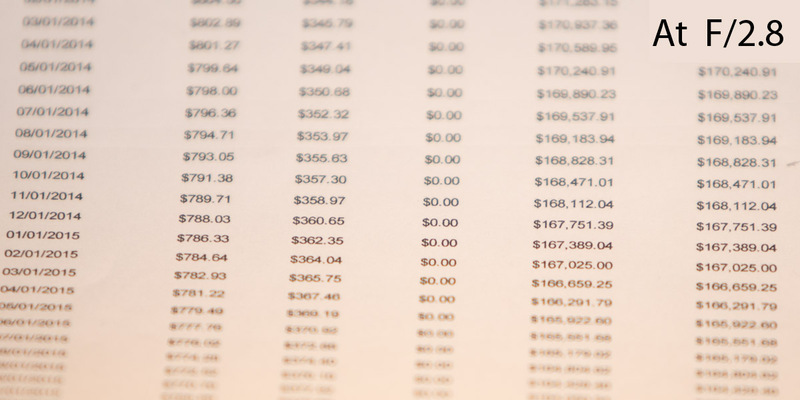 Careful selection of your focus point is critical when your lens is set at f 2.8. Did you notice anything about the photo at the beginning of this article? I focused on the tip of Mocha's nose. Her eyes are not razor sharp in the photo. Perhaps they are acceptably sharp for a web image, but not for a wall portrait. Although her eyes are only about 3 inches from the tip of her nose, they are not within the plane of focus. Because I was at a full zoom and shooting at f 2.8, I lost a little sharpness in her eyes. 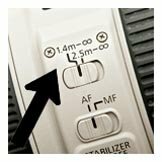 The Canon 20-200 f2.8 Lens (IS) has two different Stabilization modes. Position 1 is for hand-held camera situations. It reduces blur from vertical and horizontal movement. Position 2 is for when you are panning from side to side with a tripod or monopod. It only stabilizes the lens in the horizontal direction. 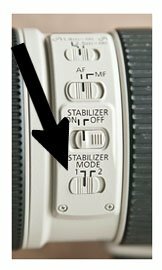 You can also use position 2 of the image stabilizer when doing sports photography and following the action in a side to side direction. Sometimes it is desirable to have a motion-blurred background and have your subject remain sharp to give you the feel of speed in your photograph. The Canon 70-200 f2.8 lens also has a focus-limiting switch. When I first bought the lens I didn't understand why anyone would want to limit the focus of their lens. It actually is quite valuable when you temporarily lose your focus when trying to follow a moving target. Rather than go through it's focus search over the entire focusing distance range, in the 2.5 meter position your lens will find it's focus point much faster. This is another good indication of the quality in design and performance of the 70-200 as a good lens for sports photography. In addition to the Canon 70-200, I also use a Canon 85mm f1.8 as a portrait lens in certain situations. It's a small, light and very fast lens. 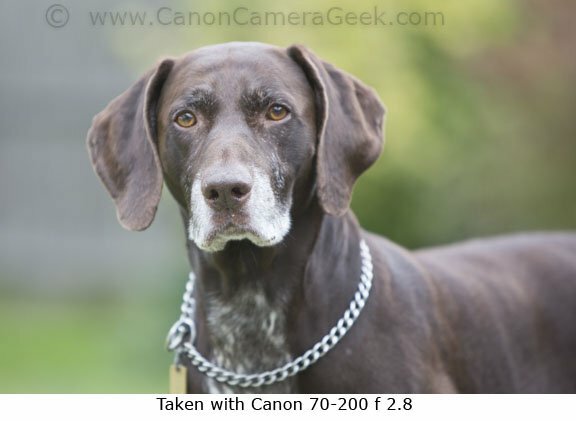 If you've read many of the other posts on Canon Camera Geek, you know I leave the scientific lens testing up to the professional Canon camera lens review sites, but I decided to test my own 70-200 lens and compare sharpness at f2.8 and f4.0. I am glad I did. The top photo was shot at F-4 and it is substantially sharper with better contrast. This bottom photo below was shot with the Canon 70-200 f2.8 at f2.8. You can also see how much faster the depth of field falls off. 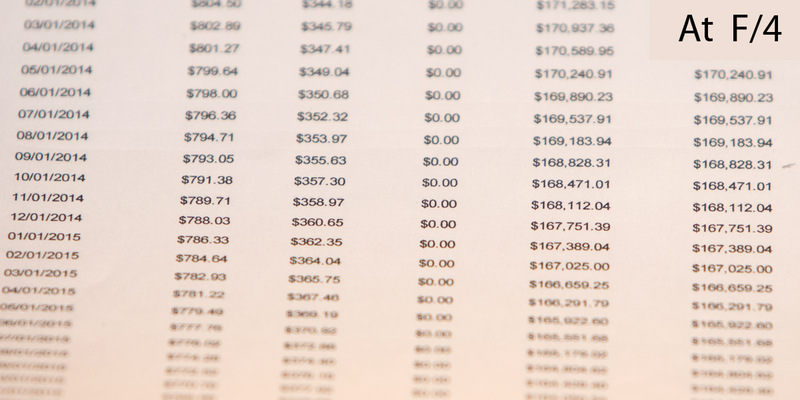 Technical data: I photographed this mortgage amortization paper with a Canon 5d Mark-III set on Manual at ISO 400 and 1/160 second and a Canon 270EX-II Speedlite mounted on the cameras hot shoe. I used a tripod and the self-timer to eliminate any motion blur. The conclusion then is that the only advantage of getting the Canon 70-200 f/2.8 lens over the 70-200 f/4 is the added f-stop shooting capability with half the light needed. The 70-200 f/4 is cheaper, lighter and easier to carry. I still love my f/2.8 and the fall-off in sharpness found at f/2.8 does not hurt my use of it for portrait photography and sports photography. 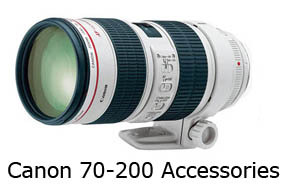 Another consideration is what Canon 70-200 lens accessories are available and worth buying. 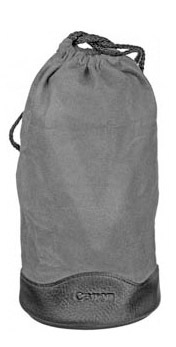 One of the accessories you must have is the Canon 70-200 f 2.8 tripod collar. The Canon 70-200 f2.8 lens is good for portraits, sports and some wildlife photography. If you need a little more reaching power, my favorite "super" telephoto is the affordable and very sharp focusing Canon 400 f5.6 L lens. If the price tag for this lens is too high or if you just can't stand carrying around this much size and weight and size, you have alternatives. Both Sigma and Tamron have versions of the Canon f/2.8 that are quite a bit cheaper. As you can see below the f/4.0 version is a whole lot more affordable. You can also save money, size, and weight if you go with the f/4.0 version of this lens. I borrowed one from Canon as part of their equipment loan program. When I pulled the f/4.0 version out of its case I literally started laughing. You have to understand that I've been using the f/2.8 version of the 70-200 for more than a decade. As a pro shooter I felt obligated to have the bigger more professional looking lens to impress my clients. What a joke! The 70-200 f/4.0 was so easy to handle, focused just as fast at the f/2.8, and still gives you great focusing bokeh wide open at f/4.0. All of the images were tack sharp too. 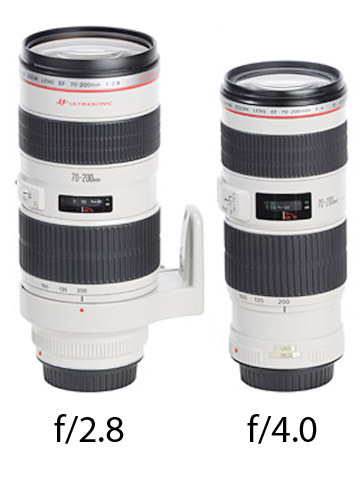 Canon 70-200 f/2.0 Vs. f/4.0.